Last Wednesday, Guadalupe Garcia de Rayos went to Mass and said a prayer before voluntarily going to her biannual appointment at the immigration office in Phoenix. Guadalupe knew that because of President Trump’s executive order on immigration enforcement, she was now considered a high priority for deportation and could be sent back to Mexico, leaving her two teenage children, both of them U.S. citizens. She went to the appointment anyway, because that’s what she has always done, and sure enough, the next day Guadalupe became national news as one of the first people deported as a result of the president’s actions. For those of us at the Kino Border Initiative, which assists migrants at facilities across the border in Nogales, in the Mexican state of Sonora, Guadalupe’s story was much more than a headline. It was personal. Not only did we help Guadalupe after her deportation by providing her with food and a place to stay, but at the Kino Border Initiative—where I serve as executive director—we help many migrants like Guadalupe, sheltering those who have been recently deported or those who are seeking safety in the U.S. This is our ministry, and as a Catholic priest, it is an answer to a divine calling. For me, the teachings of the Catholic Church are as clear as God’s commands to the people of Israel in Hebrew Scriptures: We are called to welcome widows, orphans, the poor and migrants. Sadly, these explicit instructions are as needed today as they were thousands of years ago. Nativism and xenophobia are resurgent. Those with a reasonable desire for security fall prey to the scaremongering tactics of cynical politicians. The ideals that define not only our faith but also our nation’s character are being set aside in a deeply troubling way. Perhaps no person has done more to focus the public’s attention on the plight of migrants and the risks they face than Pope Francis. When the pope visited Mexico a year ago this week, he traveled to the border with the U.S. and articulated his vision for a world where death and the exploitation of those seeking a better life are no longer commonplace. Yet President Trump, who made the building of a huge new wall on the border with Mexico a centerpiece of his campaign, has a different vision. In his controversial and legally contested executive order, Trump prioritized the deportation of any undocumented immigrant who had been convicted of a crime regardless of its nature or severity, including those who are believed to have committed crimes but have not been charged. Coming just a day after the pope’s appeal, the deportation of Guadalupe Garcia de Rayos demonstrated the consequences of the administration’s hard-line policy. Guadalupe migrated to the U.S. two decades ago to find a better life as a teenage girl and is now a married mother of two. Unfortunately, she was arrested after a workplace raid led by Maricopa County deputies in 2008 and convicted of using a fake Social Security number that she used to get a job at a water park. Although there is an ongoing case challenging the constitutionality of the raids—carried out under the aegis of the controversial Maricopa County Sheriff, Joe Arpaio, who was finally turned out of office last fall—Guadalupe, now 35, regularly checked in with immigration enforcement as she was supposed to. But on Feb. 8, she was detained at her check-in and deported within 24 hours to her native Mexico. Her family has been abruptly ripped apart. Yet she has kept her focus on what is important. This cruel and inhumane policy is not necessary. It not only destroys families but it drives others into the shadows, where they are vulnerable to crime and exploitation by unscrupulous employers. Our willingness to defend migrants is a matter of life or death in the most literal sense. Our willingness to protect the institution of the family is critical to the well-being of society. If the deportation of Guadalupe Garcia de Rayos is a sign of things to come, all people of goodwill must commit to act in good faith. This is a moral obligation. Let us pray for clarity since there are moral obligations on both sides of this immigration issue. Church and State must work out together a just course of action. Have not seen any clear cut proposals from our church just critical comments of what is happening. As a member of the Congregation of the Mission of St. Vincent de Paul, I am committed to standing up for the poor and all minorities. Standing up for migrants is one way I can do this. Peace! This woman committed a criminal offense by using a fake Social Security number. What did she do with that number? Vote? Obtain a driver's license? All of that is against the law. What kind of example is that for her children? Why did she not seek help in becoming a LEGAL immigrant, especially given that she was in the United States for over two decades? It seems to me that the more Christ-like thing to do would be to help her become a legal citizen, rather than, knowing she was here illegally, letting her continue to use a fake SS number and put herself at risk of deportation and thus depriving her children of a mother. 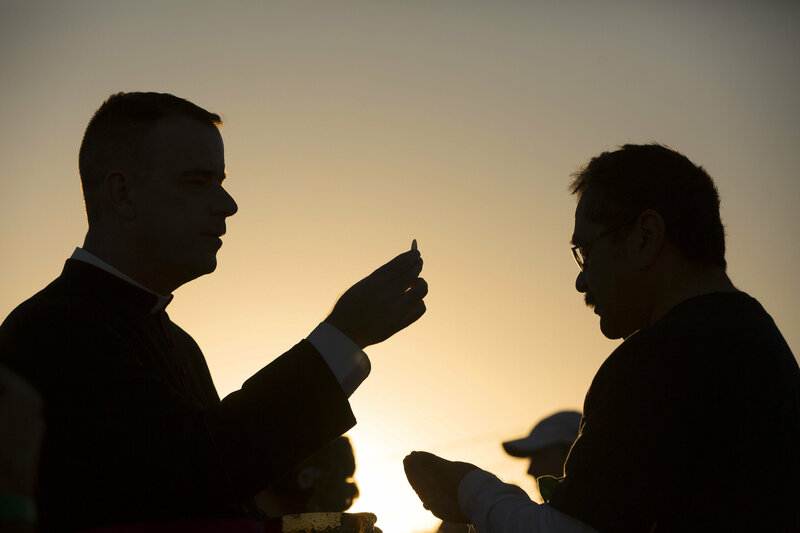 Sean Carroll, S.J., is the executive director of the Kino Border Initiative in Nogales, Mexico.